Last night I carried my two year old daughter down the steps of the Primera Junta subway stop in the neighborhood of Caballito. Mila had never ridden a subway before. 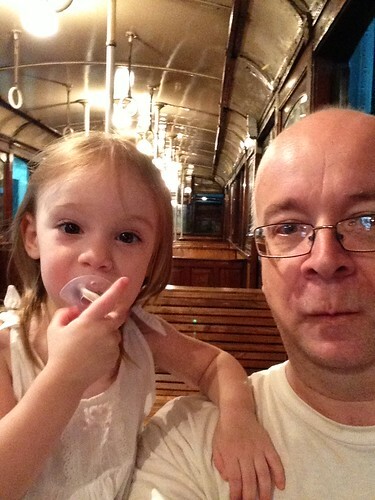 I wanted her first experience to be on the wooden old cars of the A line. We’ve been intending to take her on that line for months, but the city’s recent decision to replace the wooden cars with new cars from China prompted me finally to create a memory for myself and my daughter. We descended the steps to find an empty line of wooden cars encased in their steel frames waiting at the platform. I wasn’t the only person feeling nostalgic. A couple of young guys milled around with very nice SLR cameras. Down the platform a woman posed in the window of one car while her husband snapped a photo. A few minutes later an older couple arrived with their grandchildren. This particular train already was out of service. We waited across the platform for the next train. 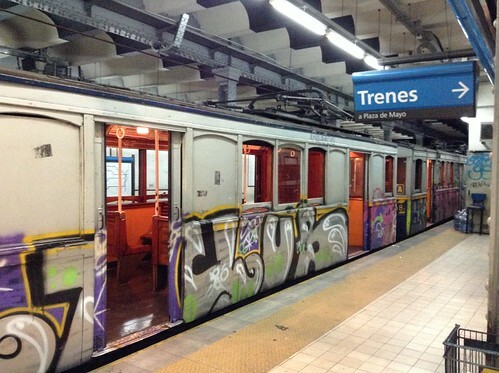 Unfortunately, the next train was not an old one but a partly now disastrous set of subway cars from the 1990s. So we waited some more. The next train was yet again a ’90s era model. I was beginning to get worried that the city had stopped the older trains a day earlier than announced. Mila at least enjoyed the graffiti splattered appearance of each train, then she thrilled with excitement as each train sped off. Another train came by with a “newer” set of cars. Finally, after about 40 minutes of waiting an old set of subway cars came to a stop. These older cars don’t have automatic doors, so an older gentlemen slid open the entrance to the wooden car so that I could enter while carrying Mila in my arms. We found a seat and I took a few photos of her as the train left the station. With the movement she nestled in my arms. Initially, her face expressed a bit of concerned but then it she figured out everything was safe and fun while she looked around taking in everything. I held the iPhone in front of her and records several minutes of video of her enjoying her first subway ride. At only two she’s unlikely to actually remember taking this ride. But with the aid of photos, videos, this posting, and my telling her about this adventure in the future then perhaps she might be able to pull out fragments of this nightly ride on the last of the A line. You’ll tell me years from now, my child, if you remember any of this night.